All in Europe is progressing smoothly even if it is the coldest late fall experienced for many a year. My mother and I limit our city walks to the bright, sunshine hours of the day, which means in these northern climes that we’re out and about for almost 45 minutes. Our stay in Paris began with a really nice Thanksgiving dinner prepared Parisian style. The restaurant served the well-known Mayflower salad featuring corn and that other ingredient familiar to Indians and Pilgrims alike–avocado. But the turkey, all kidding aside, was among the best I’d ever had and the stuffing tasted like Stouffer’s. When in Paris for Thanksgiving there’s only one wine to have–Beaujolais Nouveau. The French have banned smoking in restaurants and everyone seems to be adjusting nicely. We were a little taken aback, however, when during dinner the entire table of six next to us seemingly disappeared at once, their half-eaten Mayflower salads still moist upon their plates. It really seemed they had been sucked up by aliens. But then one of our dining companions noticed that the purses of the women were still there; we peeked out the front door and sure enough there were the six, grouped for warmth, smoking their intra-prandial cigarettes. Another custom we observed at this restaurant for the first time was the waiter sprints. About halfway through our dinner, the waitress/host dashed out of the restaurant, easily reaching top speed as she burst through the front door. I was concerned, thinking maybe she was hoofing after someone who had skipped l’addition and also worried because she was only wearing a sleeveless (and essentially backless) bright red dress. (Although I guess if you are an attractive young woman and you’re going to be sprinting through the dark winter streets of Paris, red sleeveless, backless dress would be one of your better options.) But again our wiser dining companions reassured us that sprinting and dashing waiters are common sights in small Parisian restaurants. “You see it all the time. It usually means they’ve run out of bread and five minutes later they return with half-a-dozen baguettes tucked under their armpits.” This gave me a completely new appreciation for warm French baguettes. Our waitress returned with nothing, however, thus successfully retaining her air of mystery the entire evening. Our hotel, Castille on Rue Cambon, is right next to the Chanel House in Paris. 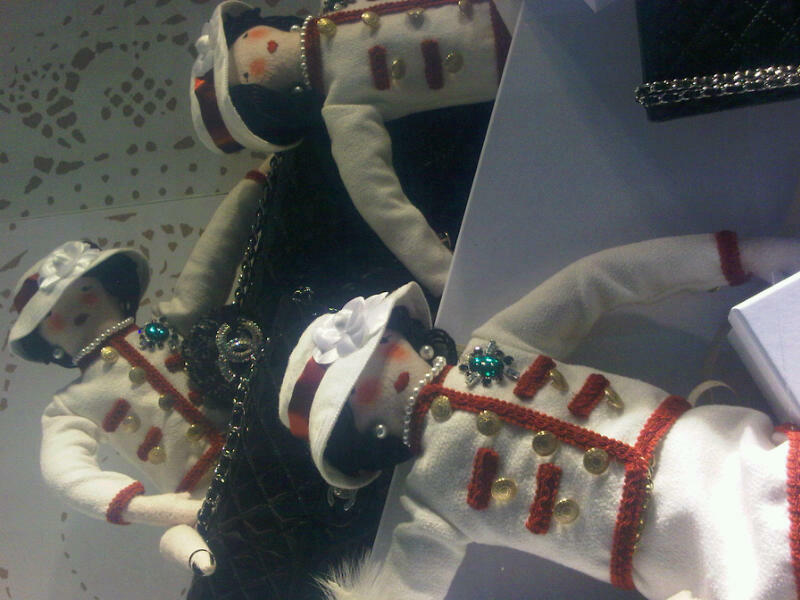 They had the cutest Chanel rag dolls as part of their Christmas window decorations. One day, as I was tweeting on the hotel computer, I noticed that on the French computer one does not have to shift to use the exclamation point. I think that says something about the French. On the Saturday we traveled to Normandie to visit the famous invasion beaches. I really recommend that but in retrospect I would pick a day other than the one following a recent snowfall. And so now we’re in Vienna. A very merry Christmas town. We visited the Hofburg Palace this afternoon. If you’ve been, you walk through room after room of the Imperial Cutlery and Dinner Service. My mother caused quite a stir as, after each even more ostentatious display of wealth, she snorted violently and said, “I can’t believe this. With all the poor people in the world, the emperor spent all his money on dishes! !” I think she’s got a good point there. Less convincing was her observation that instead of displaying these plates, it would be best to send them all to Haiti. But as I anticipated, she was fascinated by the section of the museum devoted to the life of Empress Elizabeth. The contrast between the French and the German/Austrians remains acute, despite Europe’s integration. When you’re in Paris and you come across something untidy, you think of it as charming and bohemian. If you run across the same thing in Austria, you think, oops, their standards are slipping. Or maybe it’s our stereotypes that never change. This entry was posted in Multiculturalism and tagged Austrians, France, Germans, Paris, Vienna. Bookmark the permalink.